Now that you’ve taken the LSAT, it’s time to shift your focus to writing your personal statement for law school. Does thinking about writing your personal statement for law school stress you out? Are you not sure which of your life experiences to write about? Or do you think you have a boring life and have nothing to write about? If you answered yes to any of these questions, my Write Your Personal Statement in 7 Days class was made just for YOU. This online class is taught by me–law school admissions expert Peg Cheng–via a mix of 15 online video lessons (see the video above for an example), simple writing exercises, short readings, and online discussions. You will be taught in an encouraging and uplifting Prelaw Guru way. Learning how to write your personal statement won’t be a drag–it’ll be a delight. What law schools are looking for in your personal statement. The anatomy and structure of a personal statement. How to mine your inner stories using the 49 Stories Method–a simple yet highly effective writing technique. How to calm and center yourself before you begin writing to ensure better results. Which of your stories to write about for your personal statement. The importance of story structure. The purpose of the introduction, middle, and conclusion of your essay. How long your personal statement should be and whether you need to address “Why Law?” in your essay. How to make your essay flow and get it ready for review by objective readers. By the end of this class, you will have completed the first draft of your personal statement! Lessons are available 24/7. Pick the time of day or night that works best for you. There will be short videos to watch, things to read, and straightforward exercises to complete. Work at your own pace. You can post your questions online and they will be answered later by me. When you have narrowed your 49 Stories free-writes down to your Top 5 potential statement topics, you can post them online and receive feedback from me. Unlike other classes that only give you a few months of access, this class is yours to keep. Yes! So many online classes provide no interaction at all with the instructor. Not so with my class! In my class, you receive the benefit of online discussions with me and your fellow classmates and you’ll also receive online feedback from me on your Top 5 essay topic ideas. That’s right. 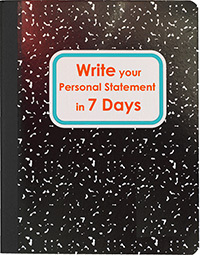 For $99, you get all seven days of online lessons that you can view and revisit as many times as you want; your questions answered online by a law school admissions and personal statement expert–that’s me; and personalized online feedback on your Top 5 potential personal statement topics. No one is offering a class this comprehensive, with this level of attention, for this low of a price. Why am I doing it? Because I’m a die-hard public servant (albeit with a private company) committed to giving accurate and affordable help for applying to law school. This class is an incredible deal that you won’t find anywhere else. What are you waiting for? CLICK HERE TO REGISTER! This entry was posted in Classes & Workshops, Videos by Peg Cheng. Bookmark the permalink.